"Let Us Remember How We Once Dealt With Death"
Eithane Hyland speech, forum 2011. 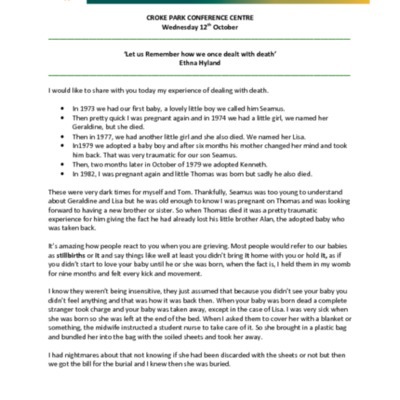 A speech given by Eithane Hyland at the 2011 End of Life Forum. Eithane Hyland., “"Let Us Remember How We Once Dealt With Death",” Archives Hospice Foundation, accessed April 21, 2019, http://archives.hospicefoundation.ie/document/1927.